"Going to a Matt and Kim concert is like going to the circus. You go to see that great finale." 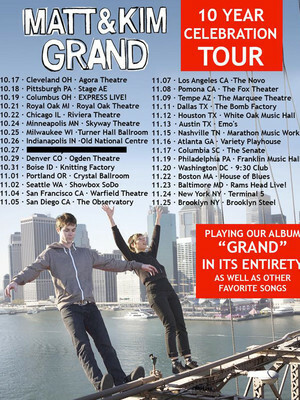 Why See Matt and Kim? The DIY indie dance pop duo Matt and Kim are anything but your average synth-punk outfit. Formed over a decade ago without much knowledge of their chosen instruments, their 2006 debut EP was widely embraced and the pair toured with a ferocity that saw them playing top festivals and signed to the independent Fader Label. Now they hit the road with their first headlining tour in three years, could it be in support of their upcoming album they plan to release in Spring? There's only one way to find out! With a penchant for putting on crazy shows, Matt and Kim's onstage energy is as infectious as their pop-tinged, upbeat, singable tunes. There are on-stage antics and dance moves aplenty (from both band and audience) as balloons cascade and confetti bursts into the air. Audience sing-alongs are encouraged, if not mandatory. For a party atmosphere and fun-filled evening, look no further. Sound good to you? 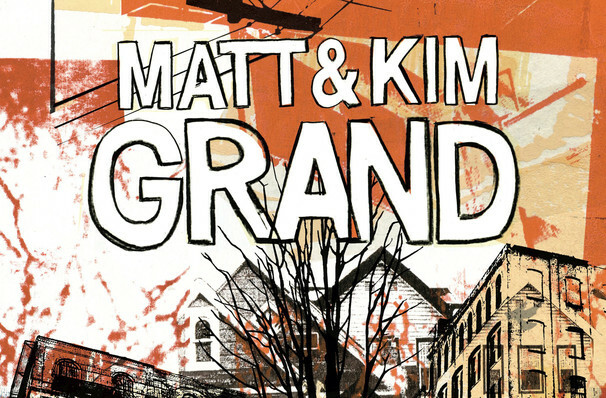 Share this page on social media and let your friends know about Matt and Kim at 9:30 Club. Please note: The term 9:30 Club and/or Matt and Kim as well as all associated graphics, logos, and/or other trademarks, tradenames or copyrights are the property of the 9:30 Club and/or Matt and Kim and are used herein for factual descriptive purposes only. We are in no way associated with or authorized by the 9:30 Club and/or Matt and Kim and neither that entity nor any of its affiliates have licensed or endorsed us to sell tickets, goods and or services in conjunction with their events.